Cover letter example for a catering porter position. Amend as suitable and start writing your own covering letter in seconds. If you want to work as a Catering Porter and you don’t know where to start then its best to visit major job sites online and search for latest vacancies. Further to your advertisement in the local newspaper for a catering porter, I would like you to consider me for the job. I understand that the duties will involve filling and emptying the dishwasher as required, together with the washing and drying of larger equipment. I don’t have any experience but I believe that the advertisement suggested that it isn’t essential. I am happy to carry out other basic kitchen duties, such as the preparation of vegetables and cleaning where necessary. I am available to work in the evenings and weekends. Although I haven’t any experience of working in a restaurant, I have previously helped out with bar work during my gap year, whilst travelling around Europe. I do have references from the owners of two bars and I enclose copies together with my CV which gives details of my educational qualifications. I am always punctual and work efficiently, and I would be pleased to attend an interview at any time convenient to you. Thank you for taking the time to read my application. 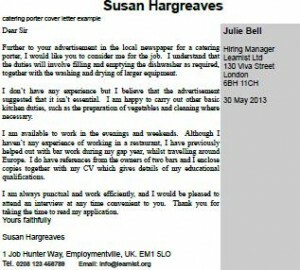 View more covering letter examples?